Bold baubles are the key to turning any outfit from average to astonishing, and I have my eyes on more than a couple pairs of stylish costume stunners. Dangle drops adorned with eye-catching Swarvoski crystals and colorful sequins give feminine flair to a sleek black suit and add pizazz to a LBD. Erickson Beamon's Rear Window earrings are on the top of my wish list and I can see wearing them on a day of shopping with my girls to a dinner date. I'd style them like so..
Love them! I have several pair of statement earrings that I LOOOVVEEE. Great choices! I love HUGE earrings, I have over 10 pairs, but it's never enough. Great collages there....thanks for the ideas!! I love that last pair of earrings. They are so different! I love anything that is different. i love earrings and they are so unique, love the 2nd and 4th pair so much! These two looks are perfect! I would wear both of them in a heartbeat! Definitely loving statement earrings #2 the most. All of these statement earrings are so pretty! And I love those jeans in that outfit. I'll take the date outfit plus the Shourouk earrings thank you very much!!! Hehehe! I think fun statement jewelry is fabulous - and love these pieces! The two looks you styled are AMAZE! I love all those earrings - great choices. Those outfits are both perfection. I love big earrings with t-shirts. So chic. I would literally LIVE in that Day time outfit!! AND those Bijoux earrings! 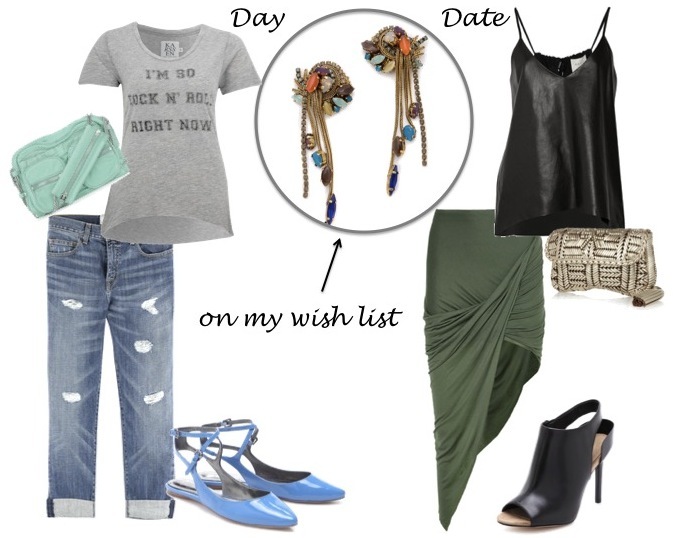 statement earrings are the best way to dress up a plain white or black tee. Those earrings are so pretty! I'm following you now, would love if you followed back. I adore your blog. Thanks for sharing your style picks! I lovelovelovelove that date outfit you chose. I would rock that! Those earrings are amazing and I love the pieces you pulled to go with them. I hope you can check out my Summer Fashion Link Up and post your take on some popular summer trends! following u back,sweetie!keep in touch! Oooh yes, definitely need some statement earrings like these! The bag and earings are SWEET! Cute picks lady! second earrings are my fave! Great picks - love 1 & 3! Very nice! Like it all!! ooh love these two looks! wow I love that earrings! all are so cute!! !